The gray sky grew a shade darker as the late afternoon light began to fade and a cold, light covering of snow dusted the sand. Walls rose quickly on either side as I left the sandy wash into yet another side canyon. Over a cluster of half buried chockstones a hallway of orange, rippled rock led on as I rounded several slight bends in the passage. Around a corner a flash of whiteness caught my peripheral vision. 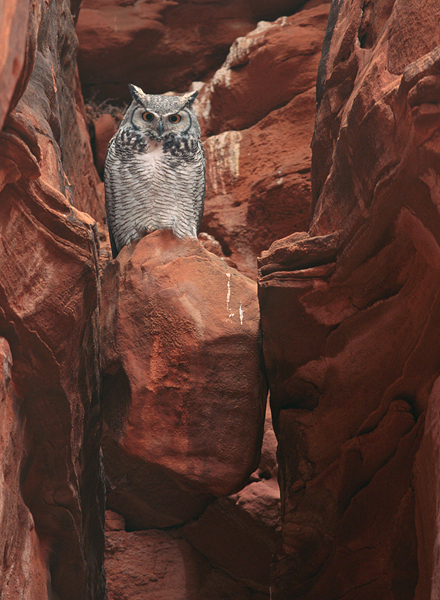 I looked up toward it, and directly into the glaring eyes of a large owl. My senses leaped and energy surged into my limbs. Somehow, I managed not to break my stride and continued another twenty or thirty feet, out of view, hoping the wary bird wouldn’t flee my intrusion. I whipped my pack off my back and quickly unfolded my tripod. A silent curse of regret passed my lips as I realized I was down to my last three frames of film. The light was dim, and I knew I would have to capture the owl perfectly motionless for the image to work. Within a minute I was ready. I took a deep breath and moved back as calmly and deliberately as I could. I set my tripod firmly in the sand and aimed the barrel of my lens before even looking to see if it was still there. It was. An eternity passed while I manually focused in the subdued light. The owl’s yellow eyes stared down at me, and I could sense it’s nervousness, as it no doubt could sense mine. I snapped the shots, and for perhaps another 20 seconds we stood face to face. Then quickly, with a simple extension of it’s wings, it shot out in perfect silence, disappearing down the canyon.